Big meals, barbecues, fish fries and iced tea. Southern hospitality has a reputation for invitation, exuberance and an abundance of comfort food. Southern cuisine comes from: Alabama, Arkansas, Georgia, Kentucky, Mississippi, North Carolina, South Carolina & Tennessee. Africans brought black-eyed peas, yams, okra, collard greens and watermelon to the south; their use of deep-fat frying as a cooking method enjoyed great popularity. Southern plantations---primarily of cotton but also of tobacco and rice---sustained the economy of the south. Plantations frequently had a smokehouse (cured ham), ice houses, gardens, livestock and a variety of domesticated fowl (pigeons, chickens, geese, ducks, and turkey). They functioned as a miniature village. 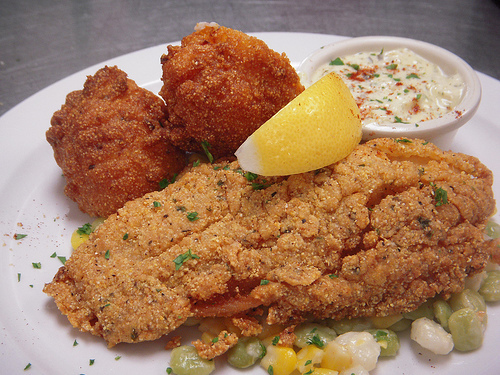 Belzoni, Mississippi, is recognized as the Catfish Capital of the world. Shrimp and Grits is a traditional Caroline dish. Hominy: corn kernels boiled in a lye solution, hulled, washed, dried. In class we made fried chicken, succotash (pictured under the fried catfish, above---it has corn, hominy and Lima beans), hush puppies (deep fried cornmeal batter), pecan pie, braised greens (red chard), fried green tomatoes, pecan crusted catfish, mashed potatoes and country gravy, biscuits and grits. I think I gained 12 pounds! *Descriptions of cuisines, associated states, historical facts and recipes come from one of my culinary school textbooks: American Regional Cuisine, Second Edition, The Art Institutes.